Soon the Government of India will be passing the recommendation that was made in the 6th pay commission about the performance related incentive scheme. A performance pay is a wage or an amount paid to an employee based on his or her overall performance. It is based on how the employees has performed in his or her respective work. It is a pay that is given in addition to the basic pay or salary of the particular employee. So now the central government has announced that soon the Performance Bonus scheme will be launched for all the government employees. The Department of Personnel and Training (DoPT) will be responsible of laying down the features and guidelines of the scheme. Government is of the view that many private companies provide performance bonus to its employees so the government too should be paying its employees with the performance bonus. This would encourage the employees in performing better. The bonus scheme this will be launched will be paid on the basis of the performance of the employees only. It should not be confused with any of the other allowances. The incentive or the bonus will be given to the employee in the basis of individual and also team or group level performance. The measurement of the bonus will be of the goals that the employee achieves and how effective output that he or she gets. There are 6 steps that has been set by the governing department on the basis of which the performance will be measures. This includes key department objectives, assigning relative weight to the objectives, specific actions to be achieved by the employee, success indicators, specifying target for success indicators, and performance evaluation. There are certain criteria’s that have been identified by the governing body, fulfilling the departments will be paid performance bonus. The two full years Results-Framework Document should be prepared by the departments. 1 Whether Performance related Incentive Scheme has been implemented by government on basis of 6th Pay Commission? As per the statement released by Minister of Personnel, Public Grievances and Pension, government has successfully implemented Incentive scheme as per the recommendation of 6th pay commission and incentives will be calculated on basis target performance which will be over the regular pay. 2 Whether government seeks suggestion from employees union before implementing Incentives suggestions recommended by 6th pay commission? Yes! Government of Indian consulted with various quarters which also includes employees union before implementing those recommendations of 6th pay commission committee on performance based incentive. 3 Whether Performance based Incentive scheme was approved by UPA government and now going to be implemented by NDA Government? Earlier in UPA government after getting approval, Performance Based Incentive Scheme for Government Employees could not Implemented in practical and it has been given as “In-Principle” status. Now NDA Government shows positive signs on approving Incentive Scheme. 4 In How many day government employees can expect the implementation of long waited Performance based Incentive Scheme? Current Prime Minister of India Narendra Modi asked his personal cabinet to set a 100 days margin on analyzing the full process and to implement the scheme. 5 Whether any new features to be included along with the recommendation of 6th pay commission? Though, there’s no official data about additional features. Yet unconfirmed leaks suggest that there may some additional features to be included by prime minister in the scheme apart from the 6th pay commission recommendation. Once the scheme is launched, all the central government employees will be assessed on the basis of their monthly performance and will be paid a performance bonus along with their basic pay. 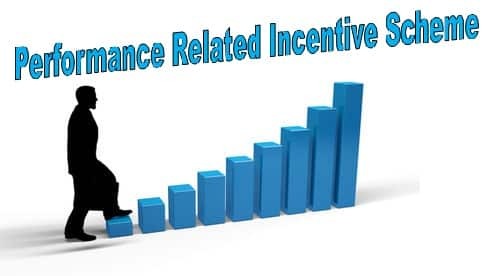 The process that has been identified for distributing incentives to the employees will be categorized into Head of Department or Secretory then comes the Head of Division or Joint Secretory and then others. The mount to be paid will be calculated on the basis of performance and also the salary that the employee gets. For the employees of the DRDO or Defense Research and Development Organization, the employees of department will be paid their performance bonus in the form of promotions. This means that as performance bonus the scientists of this department will be promoted to a higher grade than before. The Performance related incentive scheme will be applicable for the employees of the Department of Atomic Energy (DAE). They will be paid on a monthly basis. The payment will be based on their performance review in the organization once in five years.